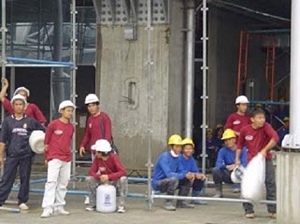 BANGKOK, March 30 – Thailand’s economists expressed concern that the country’s ongoing problem with migrant workers is likely to worsen in coming years if it is not addressed in line with the law, according to a new opinion poll. Bangkok University’s Bangkok Poll was conducted among economists from 32 leading organisations on their views towards migrant workers, their problems and the needs of the Thai economy. The survey took place March 22-29 and found that 73.5 per cent of those polled viewed migrant workers as highly essential to Thai economic expansion. Interestingly, two-thirds — 67.7 per cent — believed that Thailand will not be ready for liberalisation of the labour market by the time the ASEAN Economic Community (AEC) takes effect in 2015 as most Thai workers still lack foreign language proficiency, have undeveloped skills and are impatient. Regarding the problem of migrant workers, the respondents saw Thailand lacks good management and proper labour use to match the skills of workers. Moreover, there are legal loopholes in Thai laws regarding foreign workers. Slightly over half — 52.9 per cent of the respondents — thought the Yingluck Shinawatra administration paid little attention to address problems relating to migrant workers and 22.21 per cent said the topic received the lowest priority attention. Meanwhile, 94.1 per cent believed that the usual poor arrangements for migrant workers and relaxed rules in screening foreign workers and turning a blind eye on the illegal immigration of workers led to crimes linked to migrant workers. Nearly three out of four respondents — 72 per cent — said the problem is likely to worsen in the next few years, if the government has no new policy to address the problem. The economists surveyed also advised the government to impose rules to specify the exact number of migrant workers, categorise their skills and train them. Employers must treat migrant workers fairly and comply with the law. Any law violators should face heavy penalties in particular cases involving state officials.